This latest build of Windows is designed to run on all standard PCs that can run Windows 7. Windows 8 Consumer Preview is also opening the Windows Store, which is filled with a variety of new Metro style apps from both third-party developers and Microsoft. During the Consumer Preview, these apps are available to try and experience at no cost to users. Before you start downloading it, you must check the minimum system requirements. If your system meets minimum system requirements then only you should download it. Windows 8 Consumer Preview is available for download for both 32-bit and 64-bit systems. It is only recommended for experienced PC users to download and try it. As it is the pre-release, you are advised to back up your data and you shouldn’t test Windows 8 Consumer Preview on your primary home or business PC. 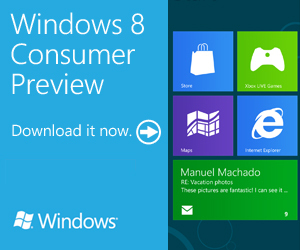 You can download Windows 8 Consumer Preview version from here. These links are of English version of Widows. It can also be downloaded in other languages – French, German, Japanese and simplified Chinese from here. Whoa, that is so exciting. I just put it to Download. There enough videos all over the Internet that allow you to get the first impression about Windows 8. SO I think I’ll wait for a stable release and then I’ll install it. How long can we use the Consumer Preview of Windows 8?